There is a vast array of signs and symptoms of menopause and perimenopause that women go through ranging from hot flashes and loss of libido to cognitive problems and a loss of muscle matter and strength. Firstly, however, let’s take a look at what exactly “perimenopause” or the “perimenopause phase” is. The term, “perimenopause” itself is coined by many women to describe the time when they first begin to experience signs and symptoms of menopause. Literally, the term itself translates into meaning the time “around” menopause. The Perimenopause phase occurs between the regular ovarian menstrual cycles and the cessation of ovarian function. When you begin to experience the menstrual cycle and flow changes, you can then expect that the perimenopause phase is ending and you are entering into menopause. For some women, the perimenopause phase lasts about a year, but for others it lasts several years. During the perimenopause phase, hormone levels tend to fluctuate and decline and cycles often become increasingly erratic as ovulation becomes less predictable. Most women go through the perimenopause phase during their forties and menopause during their fifties. No two women experience the perimenopausal phase the same way. Not all women experience difficulty going through the perimenopause phase or when they experience menopause. As with PMS, it is a matter of degree. What bothers one woman may not bother another and vice versa. 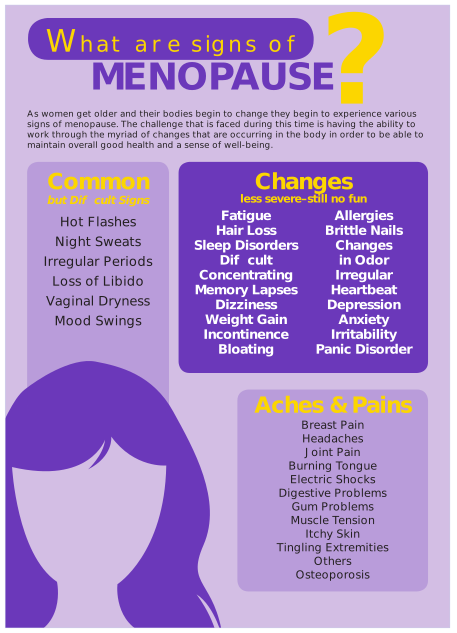 The challenge is to become astutely aware of both the subtle and obvious signs and symptoms of menopause and perimenopause and why they may be occurring. Often times, it is found that some of the more bothersome symptoms are occurring as a result of an imbalance of hormone functions. Decreases in estrogen, specifically estradiol levels, and increases or decreases in progesterone can have a huge affect on what one is feeling at any given time. MenoBalance Natural Progesterone Cream has been known to provide relief for signs and symptoms of menopause for hundreds of women. This wonderfully formulated progesterone cream contains 1800 mg of concentrated natural progesterone USP with a moisturizing cream base that includes Aloe Vera as well as an array of other essential oils. By using MenoBalance regularly, you can help get your hormones back in balance and get the relief you are looking for from the symptoms of menopause. Order yours today!